Baja Sol just reopened today. Also, the Greek Grill has closed, and demo of that space has begun. Leeann Chin must have had a slightly longer lease. Silophant wrote: Baja Sol just reopened today. Also, the Greek Grill has closed, and demo of that space has begun. Leeann Chin must have had a slightly longer lease. Noticed today that Leeann Chin is still open. They maybe working on the closed section first and this allows Leeann to stay open until their other space is ready. 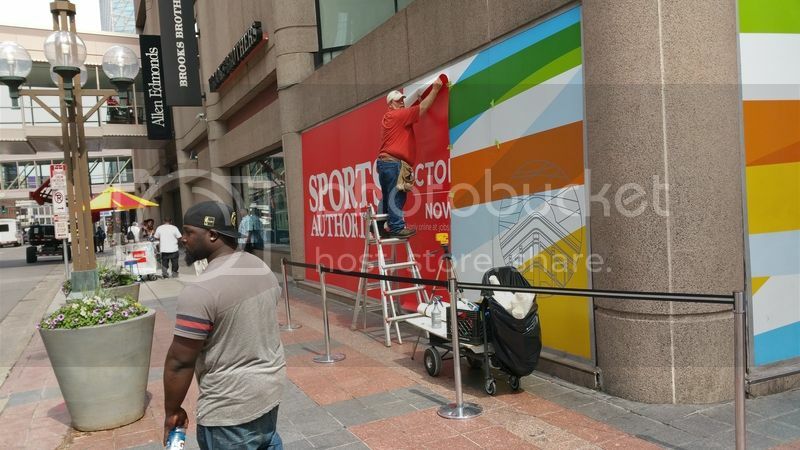 There looks to be little work being done as far as build out for Sport Authority and Sacs on Fifth. Black Friday will be here before they are ready to open at this rate. Will they be ready for the back to school push in August? Have about 5-6 weeks to get it built out to get any of the back to school sales. After that it is Black Friday which I would hope they would be ready for. Looking in both retailers space a few weeks ago, they had done very little to get ready for getting these stores built out. I don't really expect it to take too long to build out the Sports Authority. It's not like the Saks, where they have to build vertical circulation that wasn't there before. What was there before? Its been empty as long as I've been in Minneapolis. I feel like it was a Mall entrance...and there may have been a Mpls visitors center near that entrance? Silophant wrote: I don't really expect it to take too long to build out the Sports Authority. It's not like the Saks, where they have to build vertical circulation that wasn't there before. What was there before? Its been empty as long as I've been in Minneapolis. I'll agree, when looking in that there is little if any demo needed. But they have to start getting the rest of what is needed for the build out. They really need to get going if they really want to make the best of this investment. Back to school is probably second to Christmas for sales% for a clothing retailer. That is a large % of their 3rd quarter bottom line. Pretty sure that if you go way back to its original construction, each of the two Nicollet corners were anchored by a department store. At the time of the picture posted above, that was a mall entrance that ran in on a diagonal to the main central spine. 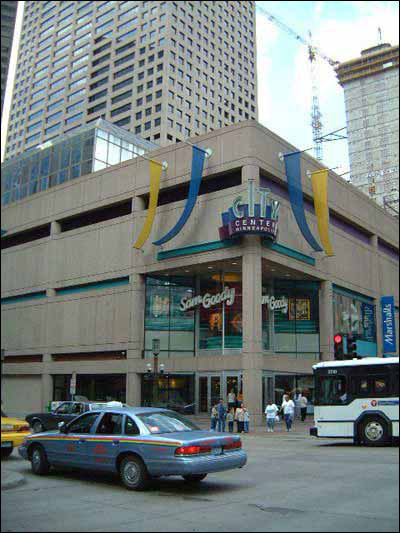 Sam Goody was located on the skyway level. Would be really interesting to see old pics of City Center, I can hardly remember it. Though they don't really seem to exist, cause who takes pics of a mall I guess. Same for Gaviidae when it opened. You can see a little of that in the movie "Drop Dead Fred"
I was in there last spring. No demo to do, it's wide open. You could see the ghosts of retail areas and the diagonal entrance on the floors. Ah, good. In retrospect, it obviously says "Octo" in mplser's pic above. Love that old City Center projecting sign on the corner. There was another large sign on the Hennepin sign that was displaced by Block E's skyway connection. Donaldson's covered the whole block fronting Nicollet. Not sure how deep that the store went, but I do believe that the current escalators are the original that were in the Donaldson's store. That is why there is an escalator to the basement and up to the third floor as well. That was all reused. I thing the Macy's Skyway went directly into the Donaldson's store much like it does with Macy's. Donaldson's was a pretty big store, basement, ground, Skyway, and I think something up on third as well. You're right, Wedgeguy: Donaldson's occupied the entire Nicollet Mall front, and the store went all the way back to the City Center atrium, and it occupied the basement and all three above-ground floors. The 7th/Nicollet street entrance opened into the men's casual clothing department, and I'm fairly sure the 7th Street skyway led directly from Dayton's to Donaldson's. The escalators now in front of Brooks Brothers were the store's escalator bank. Looks-wise, the store was fairly forgettable, but it was enormous. I spent a little time trying to track down that information about Donaldson's, and was surprised at how elusive that information was. It's surprising how quickly our 1970's to 1990's memories are fading. Maybe we need to organize an intervention to beef up the Wikipedia pages of some of these major downtown projects. So true! I would pretty much only remember it from the 90s...even then it was like a "real mall"...pretty full and active. I have tried to find pics to no avail! That sounds like the Heartthrob Cafe, but it was in St. Paul. It closed about fifteen years ago. Unless there was a 50's diner in downtown Minneapolis too. MNdible wrote: I spent a little time trying to track down that information about Donaldson's, and was surprised at how elusive that information was. It's surprising how quickly our 1970's to 1990's memories are fading. Maybe we need to organize an intervention to beef up the Wikipedia pages of some of these major downtown projects. I remember there being a television commercial for City Center in the mid 80's perhaps? It's difficult to convey the tune via this post, but the lyrics definitely included "It's the city...City Center...it's the center of attention!!!" If I ever meet any of you in person, I can sing this on demand.